IT at Barnet Council – What a disaster but who is to blame? Firstly, thanks to Rog T at the Barnet Eye for sharing the response he received to an FOI request. Rog has already blogged about RATS eating through the cables at the datacentre and the problems with security of personal data. I am sure that he and other Barnet Bloggers will be adding much more commentary on this lamentable situation. For what it is worth here is my perspective. As I read through one of the documents, the LBB Information Systems “Action Plan”, I became increasingly cross as a number of problems that I have raised and be fobbed off by the Council, turn out to be just as bad, if not worse, than I had suggested. So let’s start with something relatively simple – the price of tablet computers. Last year I complained to the Audit Committee about the outrageous cost of tablet computers (around £1,600 a pop with all the accessories). My complaint was that whilst there may be a few people who really need such expensive and complex machines the vast majority need simple straightforward machines that cost a fraction of the price. I was also contacted at the time by a number of desk based staff at the Council who were complaining that their desktop machines were in fact obsolete and made their job much harder to do as a result. The Audit Committee dismissed my concerns and the conclusion was it is easier to specify one top end machine for everyone than to look at different options. So what does the “Action Plan” have to say about this? “Tablets are very expensive and not used to their maximum potential”. “1/3 of the organisation has a problem with the desktop equipment which is impacting on the delivery of council services. This percentage will increase unless action is taken”. What did concern me further was the statement that, “increased desktop volumes will lead to an overcharge in any outsourcing arrangement”, which suggests that One Barnet Outsourcing is still at the forefront of senior management thinking, ahead of the day to day running of the council. So let’s move on to something which identified as part of my review of the annual accounts and have specifically raised with both the council and with the auditors Grant Thornton. This relates to the council’s IT infrastructure provider 2e2. The “Action Plan” says: “ The lack of an Infrastructure Manager has left the service with no direction and poor management of the 2e2 managed services contract. 2e2 contract was put in place to transfer the operational management and risk of core infrastructure to a private provider. 2e2 no longer feel responsible for this and have passed all risks back to the council, on the basis that all equipment has reached End Of Life (EOL). Now to set this in some context, according to the Supplier Payments over £500, Barnet Council paid 2e2, £1,077,913.62 in 2010/11. In particular, Barnet renewed it contract with 2e2 for last year at a cost of £400,000 on an invoice that did not appear to have been checked or authorised, a point I drew to the attention of Grant Thornton. Concerned that this apparently unchecked invoice had just been pushed through I asked who had authorised this contract renewal. A swift response from the council showed that this contract renewal was approved by the Cabinet Resources Committee in November 2009. This contract was originally let in 2005 and has been extended twice. What I want to know is why on earth did the Cabinet Resources Committee approve this contract renewal given the issues set out above – or maybe it’s because they just rubber stamp whatever is put in front of them? UPDATE: I have now seen the elements that were redacted on the original report and they make my blood boil! Under risks, the report states "2e2 will pass all risk back onto the council and not deliver to their contractual arrangements." There you have it. When the private sector don't like the contractual arrangement they shift responsibility back to the council. 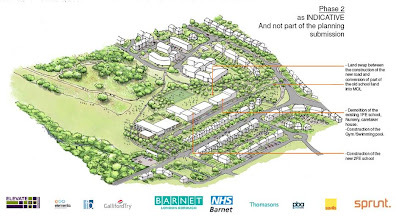 This illustrates the lie that has been peddled for the last two years by the Council over One Barnet that the private sector will take all the risks - no they won't! What is even more shocking is the proposed action to address this problem. We can now see that the redacted element states, "Improve the relationship with 2e2 and look into terminating the 2e2 contract early and bringing services and staff, under TUPE, in‐house, if necessary." So there we have it, at least you can depend on the in house team to sort out problems when the private sector give up. I have read the One Barnet outsourcing business cases and basically they are a series of assumptions and aspiration but they have no benchmarks or comparison about contract performance. I have questioned repeatedly why the council has refused point blank to allow an in house bid (other than legal services of course because the private sector weren't interested). Well now we have some benchmarks - when the private sector no longer like the contract they shift the risk back to the council. That is bad enough with the datacentre but just imagine the problems when the £1 billion of One Barnet contracts start going wrong. So now let’s move on to an old favourite of mine, SAP and the contract with Logica. I blogged about this back in April. I also raised the issue of the costs of Logica back in February. So what does the “Action Plan” have to say on this? On a system that has so far cost between £22 and £23 million I find this an utterly shocking and unacceptable situation. Now we move on to the infamous One Barnet where the “Action Plan” identifies that, “No one in the IS team believe they are the lead for the service specification in IT and as such, nothing has started. None of the Managers have the breadth of knowledge across the whole of IT to develop a specification and the sheer volume of calls in the team questions whether any capacity exists.” This creates the risk that: “Specification will be poor and not reflect the needs of the council. Timeframes will be compromised”. So much for the constant reassurance that everyone knows what they are doing on One Barnet outsourcing. Frankly, when I re-read this report I still could not believe the utter mismanagement of the entire IT/IS system. Added to this the “lack of formal project management in IS”, “there are no corporate KPIs set or reported”, “there is no IT strategy” leaves me totally without confidence in the way this council is run. In Barnet Council we appear to have a clutch of highly paid senior manager apparently dependent on external consultants to sort out this mess yet no one takes the blame and huge amounts of money appear to be being wasted. Perhaps if a lot less senior management time was spent ‘strategising’ and coming up with untested concepts like One Barnet and actually focused on running the council efficiently we would not have to make these punitive cuts that are destroying this borough. Every single Conservative councillor should be utterly ashamed at the problems we see laid bare in this report. This is an organisation completely out of control and failing to get to grips with the basics of running the council. Councillors, it is your job to keep the management in check and you have utterly failed. 22 Minutes - What’s the point? Tonight I attended the Cabinet Resources Committee which was deciding, amongst other things, the sale of Church Farmhouse Museum, the sale of the old Hendon Football Club Ground, and the award of a contract for internal audit to PricewaterhouseCoopers. The public gallery had a good representation of people. Taking pride of place in the front row was the Barnet Bugle with his trusty tripod filming the meeting. (See his video of the meeting here) In addition Mr Mustard and Mrs Angry were scrutinising the proceedings with their usual rigor. I had submitted four questions on the internal audit contract and another gentleman, Keith Martin, asked a question about Church Farmhouse Museum. Sadly, sports campaigner Gordon Kerr was denied the opportunity to speak about the sale of the old Hendon Football Club Ground. Well I wish I could say there was a full and detailed discussion about the points. Sadly it was the usual rubber stamping job with the whole meeting over in 22 minutes. There were some really big issues here that impact the community but the council’s desire to engage with the people who they are suppose to represent seems minimal. With so little debate and with such disregard for public participation I wonder why they bother holding a meeting at all. As the Barnet Press said in today’s editorial, “that no matter what, Barnet Council is going to do what it wants”. "That the disposal of the freehold interest be advertised on the open market to seek details of proposed schemes and initial bids." How utterly tragic that this Grade II listed building with parts that date back to the 17th century should just be flogged off like a secondhand car. To add insult to injury the council has chosen probably one of the worst times in the economic cycle to realise the maximum value from this site. This looks like a desperately shortsighted strategy to raise a bit of cash. Last week I reported that I had had a meeting with Barnet Council's auditors, Grant Thornton. I also had the pleasure of Mrs Angry's company who has also reported on the visit. It was a very polite and well mannered meeting but Mrs Angry and I raised a number of very serious issues which we believe should be addressed by the auditors. I subsequently wrote to Mr Hughes from Grant Thornton confirming the details of my concerns and he has had an opportunity to raise them with the council. I have set out in summary my concerns but I have not gone into too much detail as I hope several of the items are under detailed investigation. Most invoices do not contain a purchase order number, contrary to the Council Procedure Rules, Financial Administration 12.7 If this happened occasionally it would be understandable but, of the invoices I reviewed, over 80% did not have a purchase number on the original invoice suggesting this procedure is not being followed. There is very little or no supporting information on over half the invoices I reviewed. This lack of detail prevents any independent person (such as an internal auditor) checking the validity of the invoice without going back to the originator of the purchase order. I showed Mr Hughes a number of examples where payments over £1 million had been passed without the sort on information that any reasonable person would have expected to be included. Some invoices had not been stamped as checked and others had been stamped as checked but with no indication as to who had checked them or authorised the payment. There were two invoices which gave me very serious cause for concern as the description given on the invoice could in no circumstances explain the enormity of the invoice. As Mr Mustard mentioned yesterday these invoices simply didn't pass the "Sniff Test". Now it may be that they are perfectly legitimate payments and it was simply that the invoice description that was wrong but these invoices had simply been stamped checked, one, the very next day after it had been submitted with no evidence of any questioning. Taken separately all of these items could be explained away, but taken together they must raise sufficient concerns about the performance and operation of the payments department to warrant a more thorough investigation. I remain concerned that the management focus on One Barnet had led to senior managers taking their eye off the ball on the day to day running of the council and this merely serves to reinforce that view. I look forward to reading the auditor's final report which will be submitted to the Audit committee on 6 September and hope that they have taken my comments seriously. I write to you in your role as the Council’s Chief Financial Officer. As you may know, I take a great deal of interest in how the council spends council taxpayers’ money. As part of my scrutiny of the annual audit process I have made a number of requests for further clarification based on the Supplier Payments list posted on the Council’s website. In the past I have found a number of errors with this list but at least I believed that they were drawn from a list of supplier payments (which is only reasonable to do as they are called Supplier Payments). As part of my review I found a number of duplicate entries on the list which suggested that payments had been made twice and which significantly alarmed me. However, I now find out that the Supplier Payments list for 2010-11 posted on the council’s website is based on a goods receipting system and not on actual payments. Not all credits were shown on this system and as a result the figures shown are unreliable. For example there are two payments for £258,153.96 listed in the Supplier Payments for August 2010 when only one payment has actually been made according to the SAP system. I have been told that for the financial year 2011/12 all credits are being shown as well, so this should give a more accurate picture. In addition, the council is working with Logica to get a direct automated report from the SAP system (£23 million spent to date) which will show payments on a cash basis rather than an accruals basis. I hope you understand that I find this a rather unsatisfactory situation. It is now a year since supplier payments have been listed on the website yet at no time has there been a clear statement that this data was not taken from actual payments and that is may not be reliable. It is also surprising that in that year, a suitable report programme from the SAP system has not yet been finalised. The supplier payments list has serious significance; not only is it meant to provide transparency for council tax payers but it is picked up by a number of other bodies as a way of assessing how much is being spent with a specific supplier. I am now at a loss as to what to believe about the supplier payments list for last year as it has lost all creditability. I would reiterate my comments made at the recent Audit Committee, that this is yet more evidence that the shift management emphasis to delivering the One Barnet Outsourcing Programme seems to have taken away the focus of getting the day to day operation of the council running properly. Last year plans for the redevelopment of Brunswick Park Hub were hastily put forward. They were rather glossy plans and even included a new swimming pool to replace the ageing and “not fit for purpose” Church Farm Pool. However, one key issue was that they wanted to build part of the scheme on Metropolitan Open Land. With objections from the Mayor of London and the short timescale for gaining permission led to the situation where the Council missed the funding window and the scheme was dropped. The redoubtable Barnet Bugle has investigated this at some length and has unearthed a great deal of information through Freedom of Information requests. One thing I was still unclear about was how much this has cost Barnet Council taxpayers. I still don’t know the full extent of the costs but as part of my audit investigation I have unearthed a bill from Elevate Partnership for £299,269 who worked on the design of the scheme. So much money for absolutely no return. As the Barnet Bugle has quite rightly reminded me, the real tragedy here is that the old facilities were closed to make way for the new scheme, and the local community is now worse off than they were before. For the past couple of weeks I have been going through Barnet council accounts undertaking some sampling of invoices and asking follow up questions. Today was my chance to meet and discuss my concerns with the auditors and I was accompanied by Mrs Angry who also had a number of detailed questions. The meeting was, I believe, rational,constructive and well supported by evidence. At this stage I am not going to discuss the details of the meeting further as I am awaiting the response from Mr Hughes of Grant Thornton. All I will say at this stage is that I think Mrs Angry and I gave him some serious food for thought. I have invested a great deal of time freely and with no other objective than to make sure that every ratepayer in Barnet is getting value for money. I do however sometimes wish that councillors (who receive a rather generous allowance) would spend less time playing rather silly political point scoring games and focus a bit more on the day to day way in which the council is run. Interestingly, back in January when the Pledgebank was launched I did offer my half a day of time time each month, free of charge to review council invoices in order to provide an independent perspective and challenge on spending, an offer which Barnet council chose to ignore even when I followed it up some months later. So much for big society! Many Barnet residents have been disturbed by recent revelations that Barnet Council paid the MetPro security companies more than £1.4 million without making checks on the status of the company, or even having a contract. The authors of the Barnet blogs, recently praised by Eric Pickles, the Secretary of State for Communities and Local Government, for their work uncovering this scandal, are writing to you now to ask you to complete the survey below. The results will be posted on our blogs to allow voters to see how seriously our councillors are taking their responsibilities. We will post the results ward by ward; we will also note non-response. As councillors are accountable to the electorate, we think it is right and proper that you engage with the electorate and keep them informed of your views and opinions. This survey will help you to do that on a matter of keen public interest. 2. Are you satisfied that the Council has managed the issue properly? 6. Do you think a halt should be called to the One Barnet Programme while investigations continue and basic procedures in procurement and contract monitoring are improved? Thank you for your time. We look forward to receiving your answers to these questions. Of course, we would be happy to hear any comments you would like to make on the matters raised. More One Barnet Costs - when will they start saving money? The costs of the One Barnet programme continue to rise. Not satisfied with a huge raft of consultants, Barnet is now recruiting a “Service Lead for New Support and Customer Services Organisation”. This person will help with the negotiation of the contract and will be employed on a fixed term contract for a maximum of two years at a cost to Barnet ratepayers of £103,198 - £112,059 per annum. Just last week the council approved the recruitment of two more One Barnet project assistants at a cost of £150,000. Someone really needs to get a grip on the amount of money being spent on the One Barnet programme. Highly paid staff One Barnet staff; consultants costing millions. Having spent several hours on Monday at North London Business Park ploughing through supplier invoices I am utterly shocked at just how much money is being paid out on various One Barnet initiatives. This is a classic “Emperor’s New Clothes” syndrome. For goodness sake Barnet councillors, wake up and realise One Barnet is a massive money pit and as yet there is no EVIDENCE that is will actually generate any savings whatsoever.